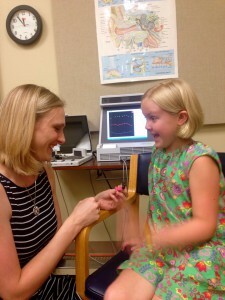 At St Joseph Institute for the Deaf, we believe all children can have quality access to sound. Our on-site audiology department can help make this belief a reality for your child. Childhood hearing loss is the beginning of a lifelong journey. You need someone to walk with you. With audiological care beginning at birth, St. Joseph Institute provides care beyond the initial diagnosis of hearing loss. Staffed by a licensed and certified Doctor of Audiology, our expertise can answer your questions, walk through the forms and help you move forward. We’ll give you a detailed explanation of the type of loss and its possible effects on listening and spoken language so that you and your family can plan your future. 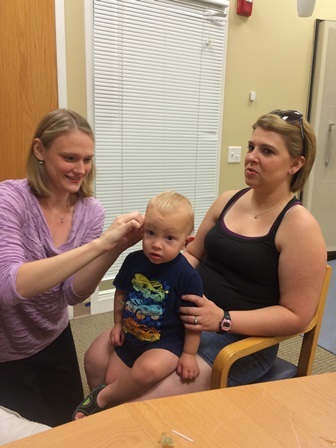 Our youngest patients (birth to 3 years) are seen once a month to monitor the stability of the hearing, to fit and adjust devices to ensure access to all speech sounds, and to watch for signs of ear infection—a common childhood ailment that can temporarily compound the effects of a hearing loss. You, the parent, become an integral partner in setting your child’s goals. Once set, our staff will work with you to determine appropriate amplification to meet those goals. Our school-age and teenage patients are seen on an annual basis for hearing testing and to check for proper equipment function to ensure success in the classroom. Does your child play a sport? Take music lessons in the band? Serve on the debate team? All of these are possible, and more. We work with your lifestyle so that you and your family can participate fully in the activities you enjoy most. Hearing aid settings are verified using behavioral responses in combination with the use of Real-Ear Measures to determine the amount of benefit being received from the devices. Contact us today at 314-918-1369 to begin your services.